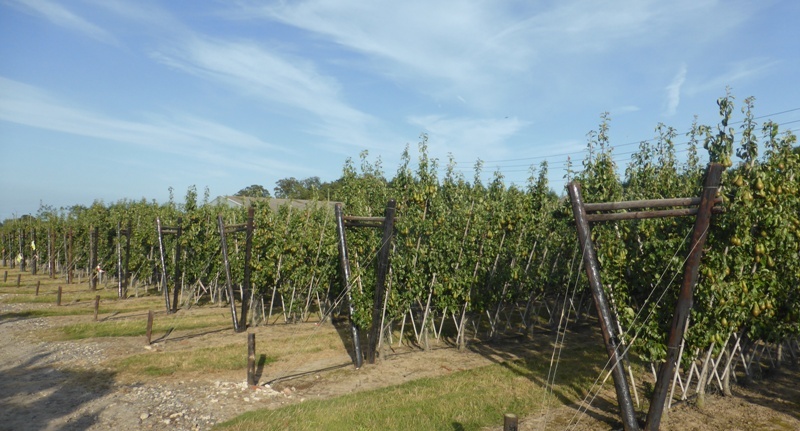 Winning the EKFS Orchard Competition is considered a 'prestigious' achievement - this year a Zari orchard at A.C.Goatham's Shrubbery Farm at Eastry in East Kent earned the accolade of Best Overall Orchard. 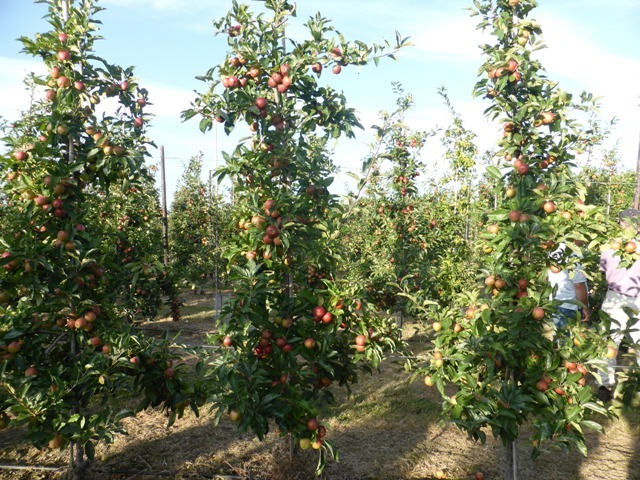 The orchard competition differs from the NFU Goudhurst & Paddock Wood Competition (reported in Journal for 12th August ) the G&P competition is judged on marks given to ALL orchards on each farm, with scores averaged to deliver a score for the whole farm. 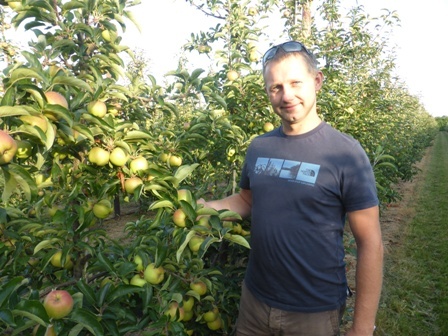 The winning ZARI orchard covers 3.62 hectares and is now 6 years old; the yields to date; 2013 = 23.5 tonnes - 2014 = 40.4 tonnes - 2015 = 43.9 tonnes (all per hectare) - A.C. Goatham Tecnical Director Nigel Stewart said initially he anticipated ZARI would crop when fully grown at circa 50 tonnes per hectare, but he now feels 40 - 45 tonnes per hectare the target yield. 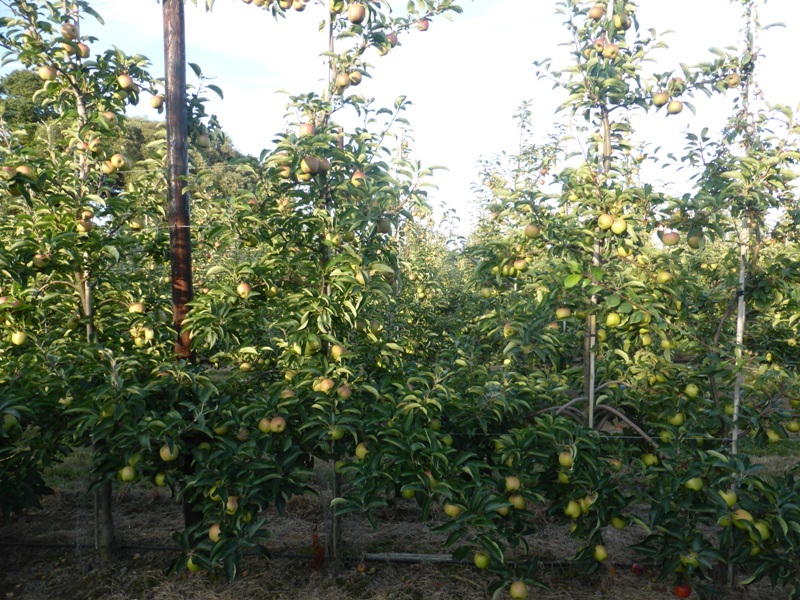 There are 3 orchard blocks of ZARI at Shrubbery Farm totaling 10.16 hectares (24.3 acres) - pollination is very important and a ratio of 1 in 5 (planted in between the ZARI trees) featuring 3 different Crab apples and Golden Delicious as pollinators is considered ideal. A.C. Goatham Technical Director Nigel Stewart said he anticipated the first pick of ZARI for this season will be in a couple of weeks time. Shrubbery Farm also has Braeburn & Gala apples, Bramley cooking apples and Comice and Conference pears. The oldest Gala is 16 and the Braeburn 14 years old. 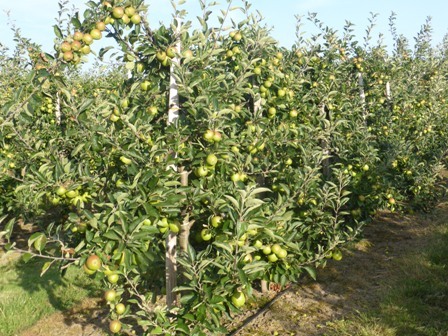 Bramley's are 24 years old and the Comice and Conference planted in the tenure of the previous grower are 46 years old. The older (16 years old) Gala cropped at 47.3 tonnes per hectare in 2014 and 48.6 tonnes in 2015. By comparison the 4 year old Gala grew 31.3 tonnes per hectare in 2014 and 60.3 tonnes in 2015; Nigel Stewart targets 65 tonnes in 2016. 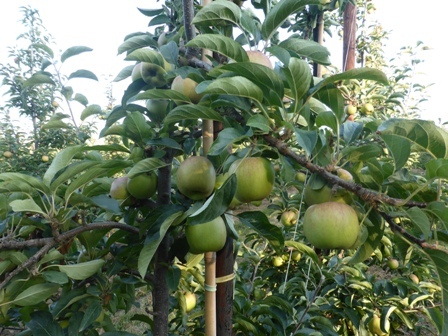 Braeburn is a variety with the potential to 'outcrop' other varieties - in southern France 100 tonnes per hectare is commonplace; the 14 year old Braeburn at Shrubbery Farm grew 78.7 tonnes per hectare in 2014 and 59.3 tonnes in 2015. 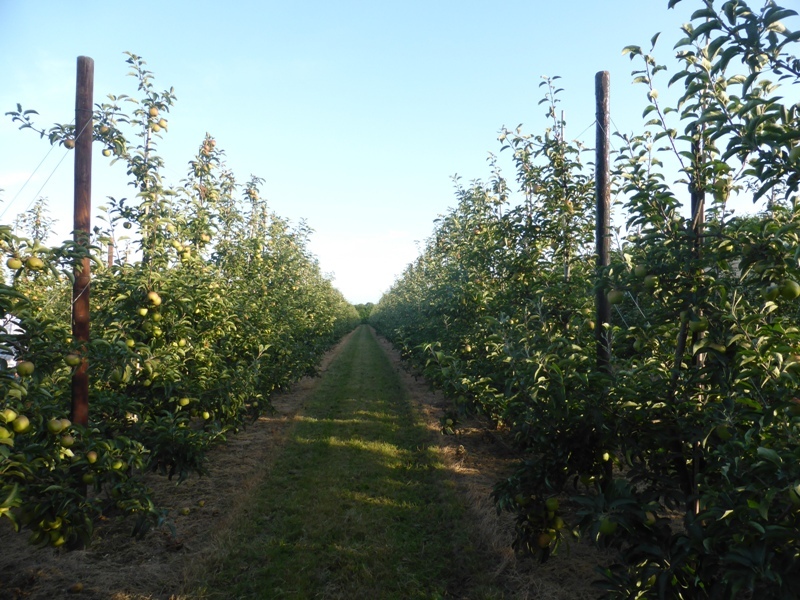 The soil at Shrubbery is of very good quality (and depth) and needs no thinning; in many UK Braeburn orchards a heavy crop will be followed by a lighter crop due to stress on the tree. 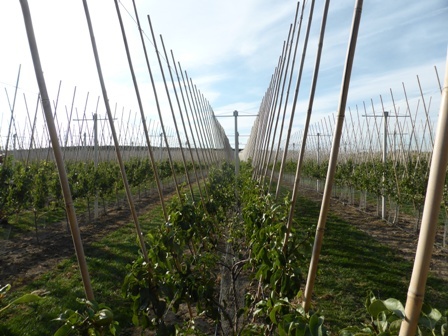 Since A.C. Goatham took on the farm which extends to 125 acres (52 hectares) - in addition to the ZARI new plantings of Gala and Conference pears have been made over the last six years. 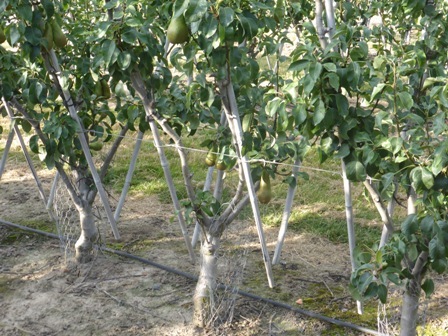 It is interesting to compare pear yields on the established (46 year old) Conference with the V system trial orchard. 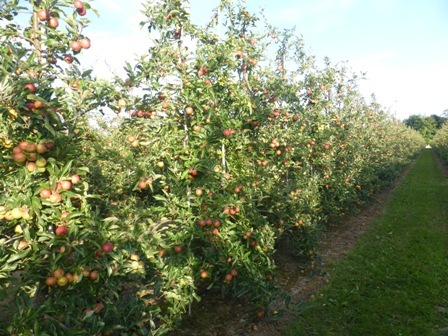 The old Conference orchard produced 15.3 tonnes in 2014 and 30.5 tonnes in 2015 - the V system produced 21.3 tonnes in its 3rd year and 42 tonnes per hectare in its 4th year! 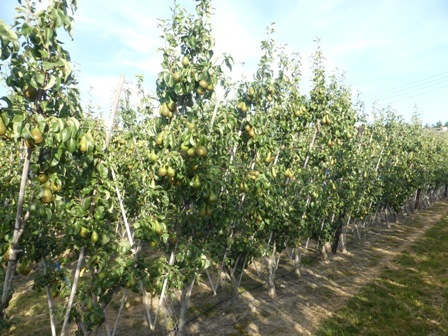 A.C. Goatham has invested heavily in new pear orchards and the format chosen is the V system which has been popular in Holland and Belgium for a number of years. 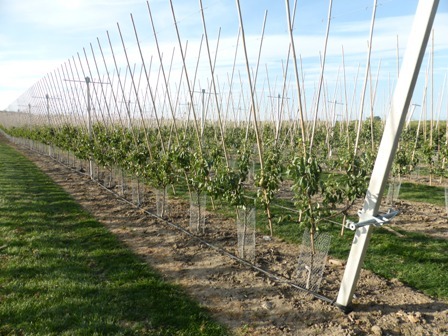 Initially a small 0.7 hectare trial orchard was planted in 2010. The results have supported the plans for a much bigger investment; the trial block has produced yields of 40 tonnes per hectare; In 2013 = 21.3 tonnes - 2014 = 42 tonnes - 2015 38.6 tonnes (all per hectare). 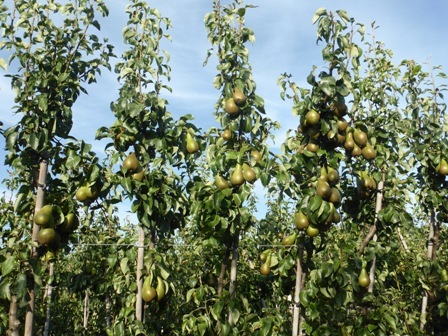 The crop and quality of the Conference pears look very good for this season. Piotr told the EKFS explained the V system is created by taking four branches from the base level as 'leaders' - the our then form a V on which the crop is hung. 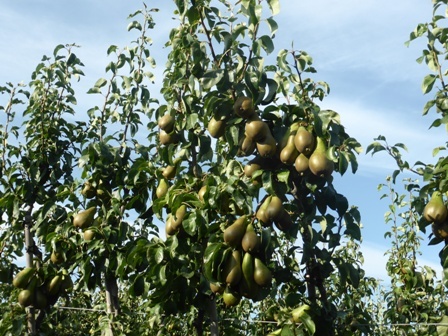 One benefit of the V format is the pears hang free on the outside making picking easier and reducing the potential for blemish from branch movement. 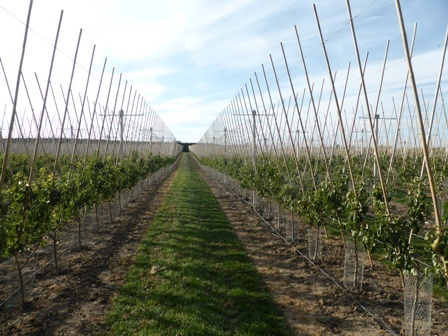 From the V system trial orchard we moved onto the new V system orchard. This is a very impressive (and expensive) new orchard with concrete posts metal tee bars and wires holding the supporting bamboo canes. 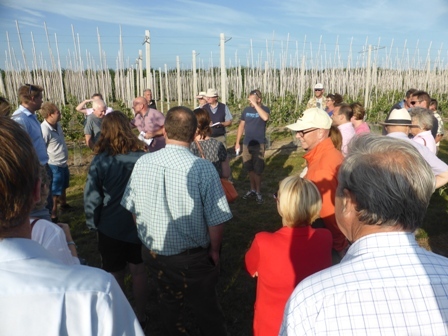 After the farm walk, EKFS members enjoyed a superb Barbecue cooked by Zest Creative Catering who manage The Barnyard at Gore Farm - A.C. Goatham & Son's prestigious visitor centre at Upchurch in Kent. The traditional ending to the farm walk; 'good grub' and refreshments in company of old friends is the icing on the cake to a great evening! 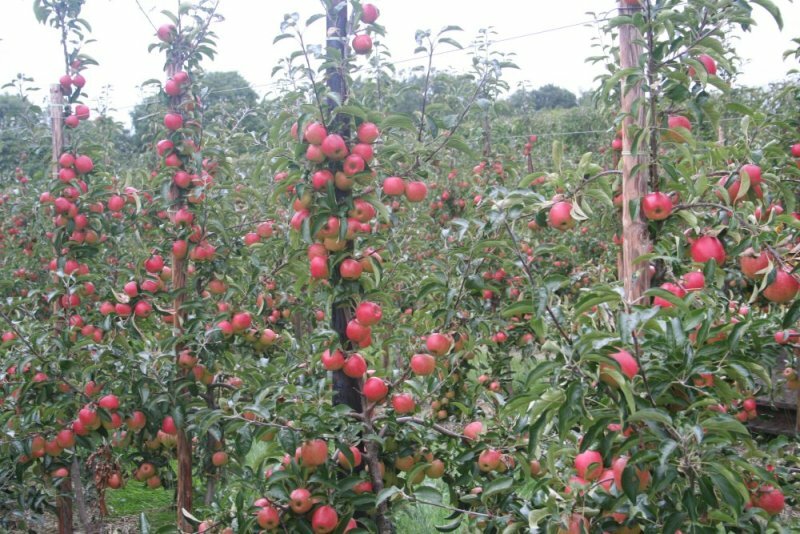 The English Apple Man Comments: It is always a joy to visit well managed orchards and Shrubbery Farm is very high on the list of 'must visit' venues. It is now 12.30am on Saturday (20th) morning and time for bed...in truth I have been watching the Olympics with one eye while finishing this week's Journal; Congratulations to all our GB athletes for their outstanding performances and well done to our 'Brilliant' Women's Hockey team for their Gold Medal performance.....'many of the team' are from the county of my birth - KENT!